Things are getting exciting at Blossom Music Center…! 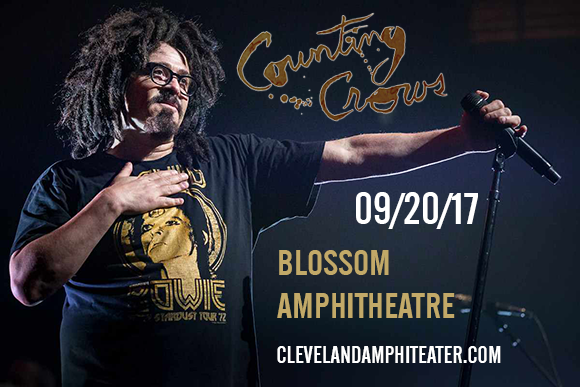 The unparalleled talent that is Counting Crows & Matchbox Twenty heads to Blossom Music Center on Wednesday 20th September 2017 for a night of solid gold entertainment as the 90s, Counting Crows take to the stage! Tickets are still available – snap yours up while you can… as there's no doubt that they won't hang around for very long!! The early 1990's rockers – Counting Crows are hitting the road across North America this coming Fall to bring an exciting set that will exceed expectations… after gaining popularity over 25 years ago, the Californian based act hit the ball running with their release of 'August and Everything After' which of course included the groundbreaking single "Mr. Jones." To this date, Counting Crows have sold an outstanding 20 million records all around the world and received plenty of awards for their talented music which celebrates the best parts of singer/songwriter and musicianship. Ten years after the beginning of their career, Counting Crows once again took over the charts with their 2004 track, "Accidentally In Love" made famous from a scene in the Blockbuster Pixar movie, Shrek 2. Get ready as they now embark on a tour across North America to bring all of their hits to the live stage!